"Easy and colorful cookies that resemble stained glass windows. This recipe contains raw eggs. We recommend that pregnant women, young children, the elderly and the infirm do not consume raw eggs." Melt together the butter and chocolate chips in the top of a double boiler or in the microwave. 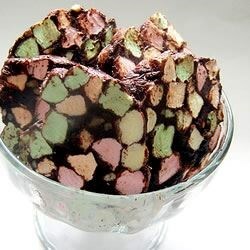 Stir to blend, then stir in the eggs, colored marshmallows and pecans. Pour the mixture into a 9x5 inch loaf pan, lined with foil. Dust with powdered sugar and refrigerate until firm. Remove chilled dough from loaf pan, remove the foil, and slice into 1/4 inch slices. Good recipe, for anyone worried about the raw egg-- they are not needed in order for the recipe to work and taste great! Very sweet. Kids love them. Fun holiday cookie. Also can roll in shredded coconut. this is a classic recipe and easy to prepare. I kept them in the fridge and they were still good a week later. If you are concerned about the uncooked egg, you can get around this by using an eggbeater type product which is pasturized. These treats are so good and so yummy. You do have to let them set for about 24 hours, though so make them WAY in advance! I made them without the pecans and they were still very good!